This stunning layered dessert combines the deep, fragrant flavours of autumn with a comforting creaminess. In a large bowl, mix together 150ml of the cider, 50g of the sugar, 2 large pinches of ground cinnamon and the lemon juice. Cover and place in the fridge until needed. Cut each apple quarter lengthways into 8 slices. Melt the butter in a large frying pan and add the apple. Scatter with the remaining cinnamon and fry the apples for about 2 minutes on each side, until golden, then remove from the heat (do this in two batches, if necessary). Place to one side. Place the remaining cider and sugar in a medium heavy-based pan over a low heat to dissolve the sugar. Then turn up the heat and boil for 3 minutes, until clear and syrupy. Pour 2 tbsp of the syrup over the apples. Return the pan to the heat and cook until sticky (this should only take about 1 minute). Leave to one side. To make the cracknel, put a sheet of tin foil on a baking sheet and scatter with the chopped hazelnuts. Put the remaining syrup back on the heat to boil. As the syrup starts to turn an even, golden, caramel colour, pour it over the nuts and encourage it to flow over the tray in a thin layer. Leave to harden for a few minutes. Break off medium-sized shards of cracknel for decorating and crack the remainder into smaller pieces. To make the syllabub, remove the cider mixture from the fridge and gradually whisk in both pots of cream. Continue to whisk, using an electric whisk, until the mixture holds its shape in soft peaks. 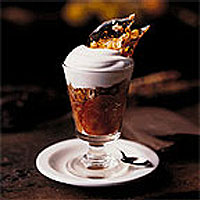 Divide the cooked apple between 6 serving glasses, scatter with the smaller pieces of cracknel and top with the syllabub. Chill if not using immediately. When ready to serve, decorate with the remaining shards of cracknel.